Chrysler: No Pacifica For You! - Cars! Cars! Cars! Chrysler: No Pacifica For You! Detroit Free Press reports: Chrysler halts work on Pacifica replacement. Looks like the Pacifica has been sent to the great spiral. We were big fans of the idea of the Pacifica (an adult minivan which has been labeled the Crossover), but never big fans of the execution. We are big fans of the Mercedes-Benz execution, the R-Class (but we're not too sure buyers are). Mr. Peterson: Why don't you just say you're fat? Mr. Peterson: Stature. No one uses that word. Mr. Peterson: You're a fatty and can't get into the back seat of the Pacifica and it's Chrysler's fault? Web: We can get into R-Class without much effort. Mr. Peterson: Whatever. And you are dressed funny today. Web: Hey! Hey! We're dressed today. Thankyouverymuch. Anyway, it seems that consumers were never really fond of the Pacifica so its replacement has been canned. That's a snap of the 2007 Chrysler Pacifica. 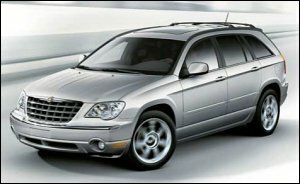 We bet you can pick up a 2006 model for cheap now that Chrysler has a crap load of them on the lots. I would be shocked if they cancelled the Pacifica. They are going to sell 80K of them this year (mostly the old 2006 models) and have a freshened 2007 which is getting solid reviews. Pacifica is finally building some momentum after a botched debut on the pricing and marketing fronts. On top of all that, this is a growing segment.